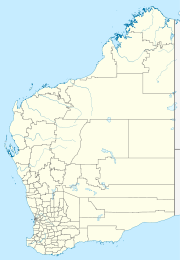 Mulga Queen is a medium-sized Aboriginal community, located 150 km north west of Laverton in the Goldfields-Esperance region of Western Australia, within the Shire of Laverton. The permanent buildings making up Mulga Queen were established in the mid 1980s. The settlement originally came about as a result of gold discoveries in the region in the late 1900s and the arrival of prospectors. These events and increasing contact with Europeans were accompanied by a breakdown of the traditional lifestyle of the Aboriginal people living in the area. Later a food depot was established by the government and Mulga Queen became established as a semi permanent camping ground for Aboriginal people. The community is managed through its incorporated body, Nurra Kurramunoo Aboriginal Corporation, incorporated under the Aboriginal Councils and Associations Act 1976 on 9 September 1987. Mulga Queen Layout Plan No.1 has been prepared in accordance with State Planning Policy 3.2 Aboriginal Settlements. Layout Plan No. was endorsed by the community on 8 September 2001 and the WAPC on 18 June 2002. The Layout Plan map-set and background report can be viewed at Planning Western Australia official site. This page was last edited on 8 February 2018, at 00:19 (UTC).